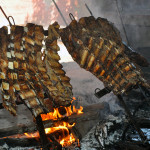 The asado is the most popular social gathering in Argentina and no weekend is truly complete without it. It’s a celebration of seared meat and flame, filled with good times and liberally doused with Malbec and Fernet and coke. 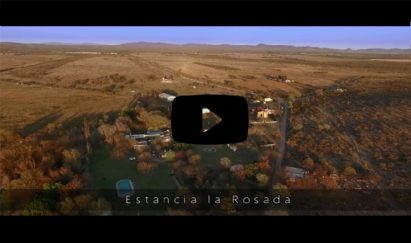 Traditionally the vast grassy plains (la pampa) which extend outwards for hundreds of miles from Buenos Aires have gifted the surrounding communities with an impressive abundance of top quality beef. The cows and horses that thrived on these very plains gave birth to the gaucho culture where the open fire was the only cooking option and meat the only dependable source of food. These days there are still more cows than people in Argentina, and not only is the beef plentiful, it’s absolutely delicious. (And tender – one top local steakhouse has taken to serving their steak with a spoon.) 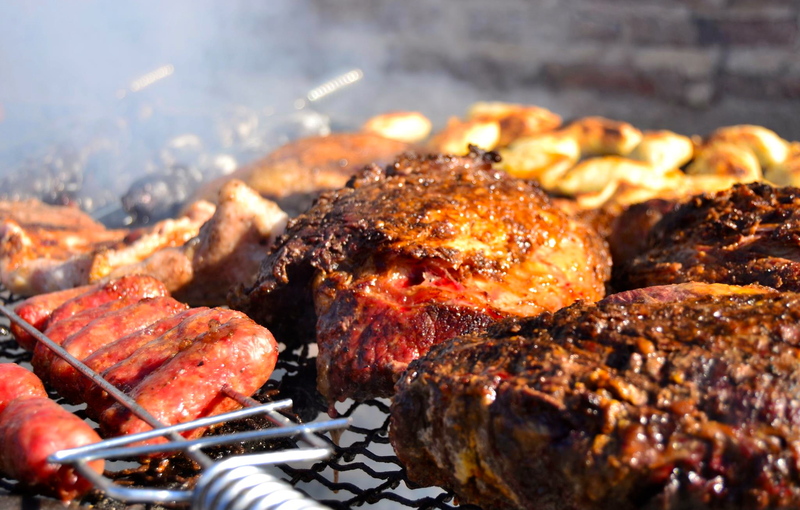 What makes Argentine beef so good? Perhaps it’s the cattle grazing on the flat pampas – lazy, well-fed cows make a tasty steak for sure. Or maybe it’s the butchers, who take pride in their mastery of bovine flesh and provide a seemingly endless list of cuts, sausages, and previously dangly bits. Perhaps the slow cooking which allows the fats to cook through the meat, leaving it leaner and tastier. Or it might be the secret of spicing (aka no spice at all, just lots of coarse barbecue salt). 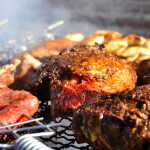 Whatever the secret, its a wonder, and its everywhere; on any given weekend, a stroll through a neighborhood is sure to leave your belly raging and your head reeling with smoke and sizzling meat sights and smells of asado. 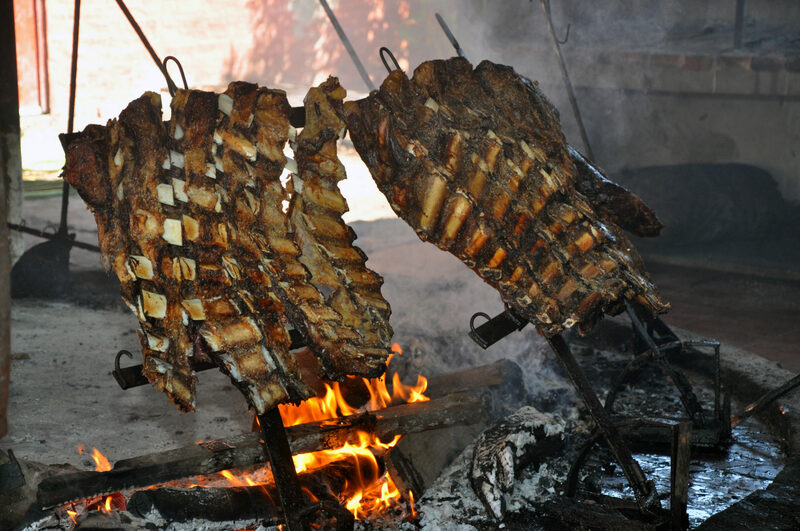 Here’s how you can replicate the Argentine asado, step by step. Tira de asado: the perennial favorite, short ribs. Mollejas: sweetbreads, delicious when cooked until crispy on a hot fire with plenty of lemon. The wood or charcoal. 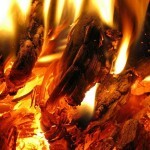 If you have to use charcoal, remember the golden rule: only use the coals once they are burned through and red hot to avoid any noxious flavors. The bread: mini-baguettes that are perfectly cut chorizo-sized. Cheese and salamis: the picada or starter. The wine: arm yourself with a couple of good Malbecs. Provoleta: rounds of provolone cheese with herbs and pepper served in tin foil plates ready for tossing onto grill. Sal gruesa: course barbecue salt, to be applied very liberally to the meat. Salad: usually limited to a very basic green salad. Now you’re all set and the asador will be nominated. Once designated, for better or worse, he or she takes charge of the process from start to finish – and no interference is tolerated. A real asador will have a razor sharp, thick bladed guacho knife that slips into the belt. Spread the coals out under the grill in a rectangular shape (nothing in the middle), creating a gentle, even heat from all sides. 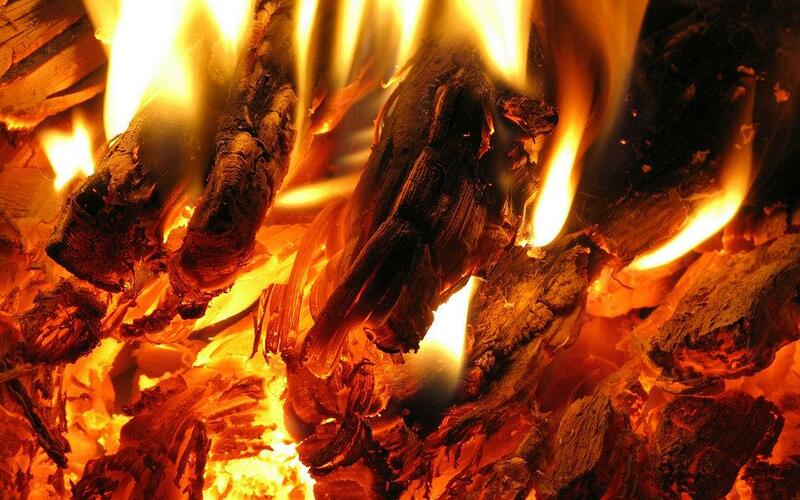 Always be sure to keep a fire going on the side to ensure that you have enough coals for at least an hour. Slow cooking is key; the temperature is right when you hear a gentle but constant sizzling. 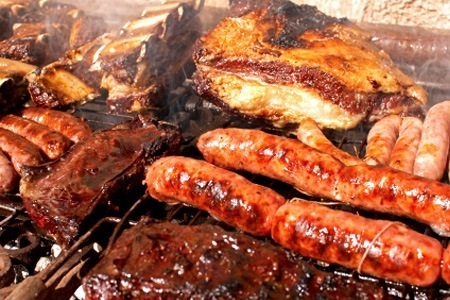 Add the beef, chorizos, morcilla, and cheese to the grill at the same time to break the asado up into various courses. Finally the meat, the climax of the event. Remember, bone-side down, fat up, for most of the time, which can be around 45 minutes in total. Never cut into it, turn it only once, and when ready, remove from the grill, slice it up into portions, and dole it out to the waiting hordes. Once the meat is served and everybody has tucked away to chat with their asado partner, someone calls out for a round of applause for the asador and everyone pauses, raises their greasy faces and sated eyes to the hero of the day and claps, at length and with a gusto. It means the same thing in every language: job well done.